Just who am I ? I am a Druid priest and the Archdruid of Ár nDríaocht Féin, A Druid Fellowship. While most of what you'll see here are my writings, musings, workshops and articles, I am also very much interested in ecstatic, primal practices and their use in trance states. Born in Richland, Washington (state), I am a graduate of the University of New Mexico with a BFA in Theatre Arts (1975), and a Diploma from the Webber Douglas Academy of Dramatic Art in London (1985). I am now working part-time towards my Masters degree in Celtic Studies from the University of Wales, Lampeter, which should be completed by the end of 2010. I am also past President and current member of the Board of Directors of Cherry Hill Seminary, a Pagan institution which exists to train folks in the skills of Pagan Ministry. I used to fly balloons and hot-air airships in my youth and served as a Vice President of the Fédération Aéronautique Internationale (FAI), then in Paris, back in the 1990's. I also served as Secretary of the FAI Aviation and Space Education Commission for 10 years and am now an FAI Companion of Honour. The ballooning memorabilia that my ex-partner and I collected is now a major part of the collection of the Anderson-Abruzzo Albuquerque International Balloon Museum in Albuquerque, New Mexico. But the main turning point in my life was when I left my then partner of 20 years, England, and half my assets to come back to the USA. The ride, since I jumped off that metaphorical cliff, has been quite wild, with a major spiritual awakening fueling my present activities. 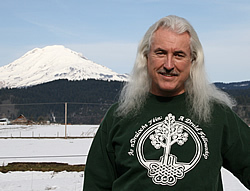 My present passions include the priesthood, Celtic studies, Indo-European cosmology, ADF liturgy (written and performed), primal ecstatic trance work, Harner Shamanism, singing, teaching, and ADF festivals. I currently live near the base of Mt. Adams at Trout Lake Abbey, our farm, in Trout Lake, Washington, with my spirit partner Kozen (a Soto Zen Buddhist Priest). We intend to have two monasteries sharing the site, one ADF Druid and one Buddhist. Luckily, Zen doesn't clash with ADF Paganism. Much.